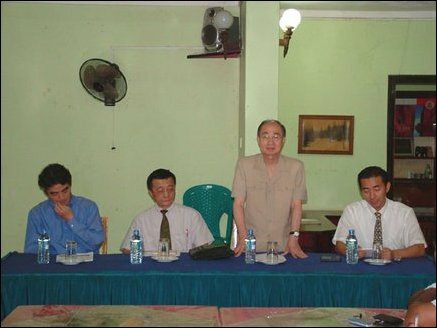 Mr. Yasushi Akashi, representative of the Government of Japan for Peace-building, Rehabilitation and Reconstruction in Sri Lanka, arrived Saturday morning in Amparai and held separate meetings with Muslim, Sinhala and Tamil delegations comprising of civil society members, sources in Amparai said. 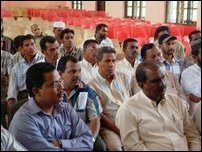 Akashi addressed Muslim representatives led by Dr Jameel at 10 a.m. at Kalmunai Zahira College. President of Amparai district Mosque Federation Moulavi A Haniffa, Jamiethul Ulama Sabah- (JUS) members led by Moulavi Ibrahim, Director of Muslim Peace Secretariat A A Abdul Kalam, District co-ordinators and peace group activists participated in the discussions. 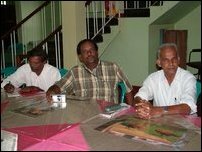 Following this meeting Akashi met with about ten Sinhala representatives led Grindawela Somaratne at 1.00 p.m. at the Gal Oya rest house premises. Mr Akashi then had discussions with a six member Tamil group led by Assistant Director of Education Mr Sahadeva between 2.30 p.m. and 3.30 p.m., slurces said. At the conclusion of the meetings Mr Akashi said: "Japan will work assiduously to help all three communities to live in peace." Earlier, talking to the Muslim representatives, Akashi said, "We regret the violent incidents happening in the east and will increase our focus to the eastern region. In our peace efforts we will ensure that the welfare and security of the Muslim community is given due prominence. We are studying in depth the issues and problems affecting all communities and exploring ways to formulate peace plans that will help all communities."